The full Capitol Corridor runs 168 miles from San Jose to Auburn in the foothills of the Sierras, although this 35 mile extension from Sacramento is served just once per day (during rush hours) with full service from San Jose to Auburn only running on weekends (on weekdays this train ends at Oakland-Jack London Square). The core of the corridor is only 90 miles from Oakland-Jack London Square to Sacramento, nearly the same length as the Altamont Commuter Express Train from San Jose to Stockton. Additional Throughway bus connections provide additional service fequencies to Auburn and San Jose, with buses (that also connect with San Joaquin Trains) running as far north as Arcata and Redding, east to Reno and Sparks, and south to San Louis Obispo (and Santa Barbara) connecting to the Pacific Surfliner. These throughway buses also provide additional service to all California stations (except Dunsmuir) and as far as Reno on the long-distance Coast Starlight and California Zephyr that run along the Capitol Corridor. Generally trains run in push-pull mode with 3 to 4 California Cars. These cars are double-decker coaches, equipped with bike racks that can be used free of charge (and reservation free) for everyday commuters, along with a cafe/lounge car (although cost-cutting has resulted in one evening round-trip running unstaffed) where food service and seating is upstairs. All trains are unreserved, which leads to rather high ticket prices (none of the usual bucket prices that reward planning ahead for leisure travel), that are often combatted by decent deals (often including companion discounts) on off-peak and weekend trains. Weekday morning trains (in both directions) have quiet cars (since 2003). Permanent Wifi has been available on all trains since November 28, 2011, although the first Wi-fi trials occurred as far back as March 20014. Amtrak eTicketing was introduced on April 16, 2012 as one of the pilot corridors (it was introduced system-wide in August 2012). Capitol Corridor's commuter rail nature, with trains that open all doors at all stops and unreserved seats makes fare evasion a bit of a problem. To combat fraudulent seat checks conductors carry receipt scanners that print out receipt seat checks for a specific train. The Capitol Corridor is Amtrak's newest corridor service and is fully funded by the state through the Caltrans Division of Rail and Mass Transportation. The Capitolsroute began as directly as a result of two 1990 California bond and tax increase ballot initiatives. Today Amtrak California routes (including the Capitol Corridor) are funded primarily through taxes on diesel fuel. The corridor began operations with just 3 daily round-trips (using Horizon Coaches) from San Jose to Sacramento (with one round-trip continuing to Roseville, possibly only due to needing the train yard there for overnight storage) using Horizon Cars. In the mid-1990s new double-deck California Cars, modeled on Superliners except with two automatic doors per car began operations. 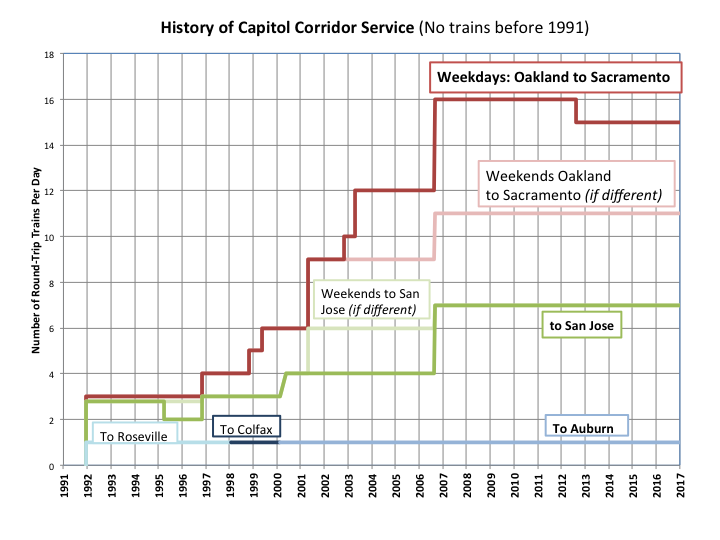 Service increases happened particularly after 1998 when the Capital Corridor Joint Powers Authority (with representatives from all 8 counties on the route) got direct control of the service and led to an aggressive expansion program particular in the core of the corridor between Oakland and Sacramento (further increasing service to San Jose is desired through track improvements increasing double-tracking). Service north of Sacramento has an interesting history, when service in 1998 was expanded north it originally ran all the way to Colfax, a further 15 miles, with service in Auburn stopping at two different stations depending upon the train's direction (due to directional trackage used by the Union Pacific to climb into the Sierras). A lack of ridership led to threats of service cuts back to Roseville but the train already had a devout following of regular commuters who managed to save the train, pushing it back to Auburn (where the train spends the night on the locked siding in the station) with a more permanent station built along the normal eastbound railroad. This means the morning westbound train wrong-rails from Auburn the 14 miles to Rocklin. This is one reason (also most-likely a lack of long-distance ridership) that the California Zephyr doesn't serve Auburn so it can follow the normal flow of freight traffic down the Sierras.